What a weekend of rugby at Twickenham Stadium. South Africa was down 19-18 with five minutes to go when a try by Fourie du Preez gave the Springboks the margin they needed to beat Wales on Saturday. 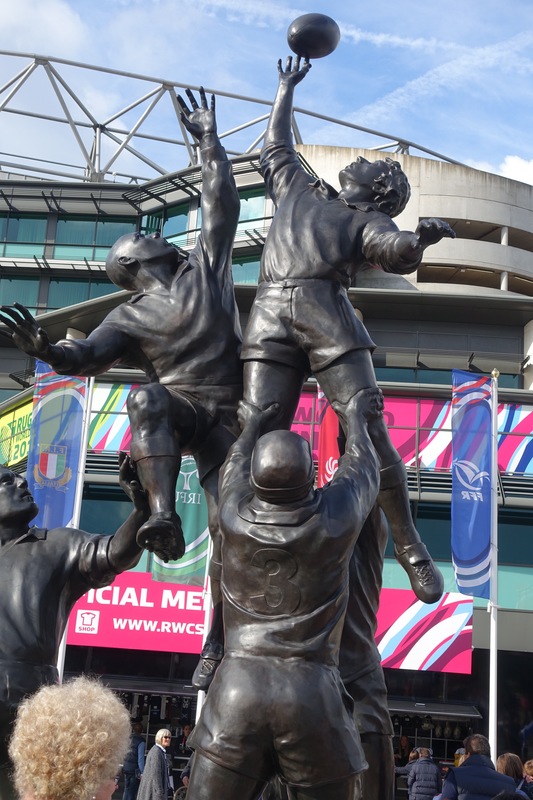 Statue of a lineout at the entrance to Twickenham Stadium. Obviously helps to have a high-percentage kicker on the field. Pollard missed two penalty kicks, and Biggar had one hit the upright and fall back into play. In between all the scoring by kicks, there was some furious loose play and some exciting runs. Both tries scored came from remarkable ball handling, especially the Wales try after Biggar gathered in his own kick and made the pass to Davies as he was tackled. Both teams played hard; the clock ran out with South Africa ahead. Plenty for Scotland. Papers Monday morning screaming about how the Scots were robbed “at the death” and bringing special attention to the post-game dash into the tunnel and out of the public eye by referee Craig Joubert. Scotland throws to the back of a lineout but David Denton can’t handle it. My friend Eddie, who went to the game with me, points out that had Scotland secured the ball in the lineout and kept possession for less than two minutes, they would have won. But they didn’t. Instead, the ball was knocked forward by Scot wing forward John Hardie. The ball careens into Australian Nick Phipps and then to the ground. Welsh falls on the ball and is called for being in an offside position. As Cleary says in his report, “Joubert ruled that . . . Welsh was in an offside position following the initial knock-on by John Hardie.” But if Phipps was intentionally trying to play the ball — after the match he said he was — and then knocks it forward, that puts Welsh onsides — he’s in front of the Australian player. To me, it looked like the ball bounced off Phipps and went to the side of Welsh, who turned and fell on the ball from the Australian side of the play. But after Phipps touches the ball, it’s in open play and Welsh can play a loose ball from any direction. Robbed at the death, I say. 42:00 Sean Maitland is called for intentionally knocking the ball forward. Scotland playing with 14 men for 10 minutes. 78:10 Penalty kick by Foley. 35-34 Australia wins. Besides the bad call at the end of the game that gave the win to Australia, I think that all yellow cards given for an intentional knock on are too harsh. Even if the player knocks the ball forward intentionally, I think it should be a penalty kick only. For one thing, that would take refs off the hook in deciding whether the play was an intentional foul. And yellow cards should be reserved for dangerous play, not mishandling. You have to love tries that pop up out of nowhere, usually the result of an alert player taking advantage of the other teams’ mistakes or capitalizing on their own good play. That was the case for two Scotland tries. Finn Russel gathered in an Australian kick he blocked and then tossed the ball up to Tommy Seymour who was in good support and went in for the try. Mark Bennett scored his try by stepping in front of an Australian back, intercepting the intended pass to that back and dashing in for a score under the post. Worth the price of admission, robbery and all. What’s rugby without rain? 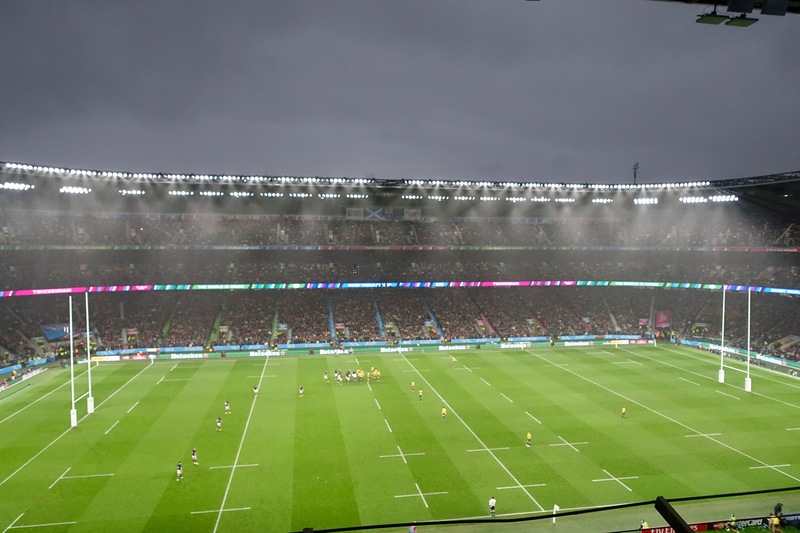 It fell at Twickenham on Sunday 71 minutes into the game. Posted on October 19, 2015 October 19, 2015 by jbsaulPosted in RugbyTagged Argentina, Australia, France, Ireland, Joubert, New Zealand, Rugby World Cup, RWC2015, Scotland, South Africa, Wales.